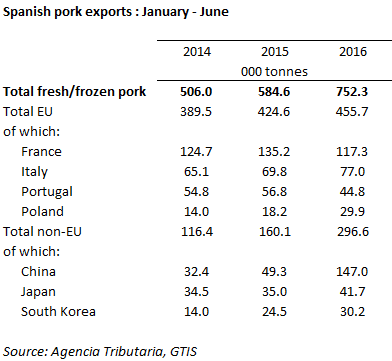 SPAIN - In the first six months of 2016, exports of Spanish pork increased 29 per cent, to 752 thousand tonnes. This increase was spearheaded by exports to China trebling in volume on the same period a year earlier, and they now account for 20 per cent of all Spanish pork exports, growing from 8 per cent in the first half of 2015. With the December census showing a growing Spanish pig herd, the strong Chinese demand provides a welcome opportunity to trade the extra product. Intra-EU exports also recorded a 7 per cent rise in the first six months, with Italian shipments increasing 10 per cent, while Polish exports grew 64 per cent on the same period a year earlier. This growth was somewhat mitigated by falls in shipments to France and Portugal, back 13 per cent and 21 per cent respectively. The value of Spanish exports grew over the first half of the year, although behind volume growth rates. Values were up 18 per cent, to €1,515 million. Again, much of this value growth can be attributed to the strong Chinese demand, with the Chinese pig prices recording record highs during H1 2016. Despite the increasing European pig price, the value of EU trade was back 3 per cent on the year earlier. However, this time period will take into account the low EU pig prices seen during the first quarter of the year.